*In Minnesota, 6th grade is a float grade. If your 6th grader is in elementary school this year, please sign them up to attend Chippewa week. If they are in middle school this year, please sign them up to attend Flambeau week. We don’t have space to put all 6th graders in one week or the other, so we appreciate your flexibility. Deadline for Minnesota Residential Camp sessions is May 1st. Deadline for Wisconsin Residential Camp is June 1st. New users – create an account on the right side of the page. Do not use your camper’s name with your new user account, please use your name. In addition to the registration form, a physical exam is required for your child’s application to be considered complete. We encourage you to make the appointment soon. Please contact your insurance provider if you will need to arrange for an earlier physical to meet the registration deadline. There is an option for you to upload the physical document during the registration process, or you may fax or email after your child’s appointment. ¿Necesitas ayuda en Español? Envíanos un mensaje a info@campodayin.org para aprender más sobre Camp Odayin, contestar tus preguntas y obtener ayuda llenando la aplicación. Physical form and photo. Or alternatively, you can email (info@campodayin.org) these items after submitting the online form. Information about special education services or accommodations at school. If your child is on an IEP or 504 plan at school, please mail or email (info@campodayin.org) a copy of the plan to Camp Odayin. 2. Medical form is filled out by a nurse at your child’s cardiology clinic. Once you complete the online registration, we notify your child’s cardiology clinic. Your clinic will submit the completed medical form and clinic notes from your child’s last appointment, including test results. 3. Cardiologist approval – Once the nurse at your child’s cardiology clinic completes the medical form, the cardiologist is notified to provide approval. When will you hear from us? Accepted MN and WI Residential campers will hear from us in June with additional camp details. Day campers will hear from us in July. If your child does not meet our criteria for acceptance we will contact you in May when all forms are reviewed by our medical and leadership teams. Camp Odayin’s residential program is for children with heart disease in grades 1-11, who would benefit from connecting with other young people who may share similar health, emotional, and social concerns. Camper eligibility is determined upon recommendation by a pediatric cardiologist and approval by the Camp Odayin Medical Director. The camp director and your child’s cardiologist can help you assess if your child should apply to attend camp. The only charge to a camper is $25. Camper registration is available in early March. The registration deadlines are May 1st for MN Residential Camp and June 1st for WI Residential Camp. Registrations are processed on a first come, first served basis. After your child’s registration is complete, you will receive transportation information, packing lists and additional details. As part of the registration process, campers need to receive a general physical exam from a pediatrician (not their cardiologist) within one year of the first day of camp. Please contact us to request to be on our heart families mailing list. Parents often want to know if their child is ready for a camp experience. While there isn’t one “sure fire” way to determine this, the questions in Ditter’s Ready, Set, Go! document can be used to help determine a child’s readiness. Please visit the Frequently Asked Questions page and don’t hesitate to contact us with any questions. We are able to offer transportation scholarships for those in need. Up to $300 can be reimbursed for your travel costs. We are also able to cover your child’s cost to attend camp if you are unable. Contact the Camp Odayin office at brooke@campodayin.org if your family would benefit from financial support. 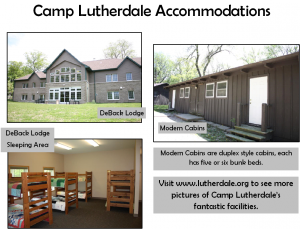 One Residential Camp session for campers in grades 1-11 is hosted at Camp Lutherdale in Elkhorn, WI on beautiful spring fed Lauderdale Lakes. 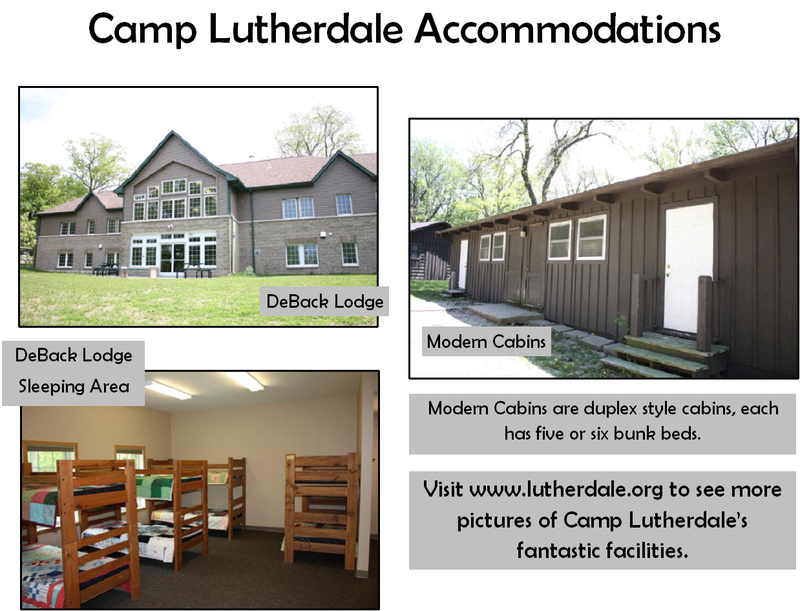 Camp Lutherdale is located 45 miles from Milwaukee, 60 miles from Madison and 70 miles from Chicago. Round trip transportation is provided to Camp Lutherdale from Menomonee Falls (Milwaukee), WI and Rosemont (Chicago), IL. A bus leaves Monday morning and returns Friday afternoon. 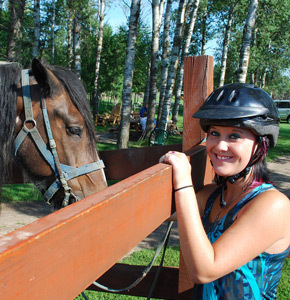 Three sessions, divided by age, are located at Camp Knutson in Crosslake, Minnesota on a peninsula of 30 acres of beautiful forest with a mile of private shoreline on Trout and Lower Whitefish Lakes. Camp Knutson is just a 3 hour drive north of the Minneapolis/ St.Paul area. Round trip transportation is provided to Camp Knutson from Minneapolis. A bus leaves Monday morning and returns Friday afternoon. The drop off and pick up site is close to the Minneapolis/St. Paul Airport to accommodate our campers arriving via plane. 9:15 AM Three or four activity rotations (archery, horseback riding, arts & crafts, nature, boat rides, geocaching, and more) through out the morning.